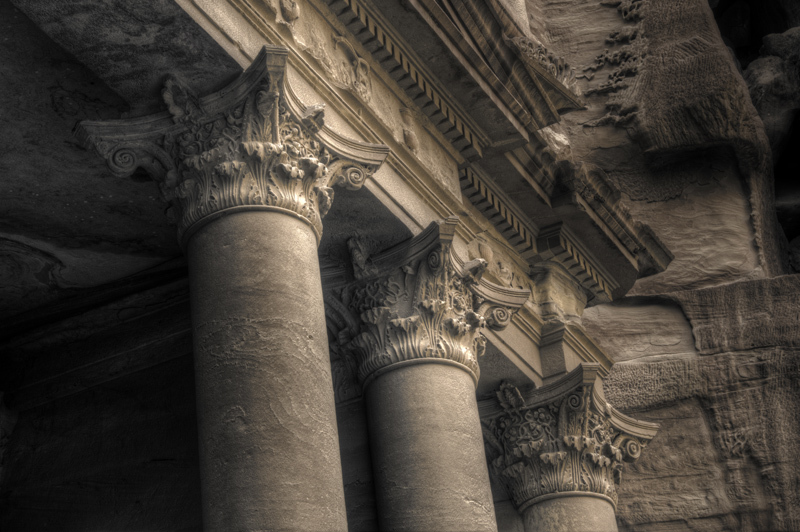 Al Khazneh (“The Treasury”; Arabic: الخزنة‎) is one of the most elaborate buildings in the ancient Jordanian city of Petra. As with most of the other buildings in this ancient town, including the Monastery (Arabic: Ad Deir), this structure was also carved out of a sandstone rock face. It has classical Greek-influenced architecture, and it is a popular tourist attraction. It is unknown as to why or exactly when Al Khazneh was originally built, probably between 100 BC and AD 200. Its Arabic name Treasury derives from one legend that bandits or pirates hid their loot in a stone urn high on the second level. Significant damage from bullets can be seen on the urn. Local lore attributes this to Bedouins, who are said to have shot at the urn in hopes of breaking it open and spilling out the “treasure” within (the decorative urn, however, is solid sandstone). Another is that it functioned as a treasury of the Egyptian Pharaoh of the time of Moses (Khaznet Far’oun). Many of the building’s architectural details have eroded away during the two thousand years since it was carved and sculpted from the cliff. The sculptures are thought to be those of various mythological figures associated with the afterlife.On top are figures of four eagles that would carry away the souls. The figures on the upper level are dancingAmazons with double-axes. The entrance is flanked by statues of the twins Castor and Pollux who lived partly on Olympus and partly in the underworld. There are burial chambers on either side of a ramp which were added in 1938.